It seems there is a syntax error in the synchronization script I have written. But the problem is, I don't know which line is causing this error in my Java code...? The solution to this error is to remove the "action (mobielcmp): begin_upload" line. To remove it right click on that line and choose to delete it. Hmmm. I thought we ignored scripts that were all whitespace. I'll check into that. So you must have been redeploying the sync model after you ran ml_add_connection_script with null for the script body. Thanks for adding that missing information and the solution! The "syntax error near end of line" error is usually due to a trailing semi-colon (;) character. If you have a trailing semi-colon in your begin_upload script, try removing it. If that doesn't work, please post a -v+ log. That way we'll be able to see the script and you/we should be able to see what's going on. One change you need to make is to call ml_add_java_connection_script for handle_UploadData, not ml_add_connection_script. This script is currently being defined as 'sql' instead of 'java'. 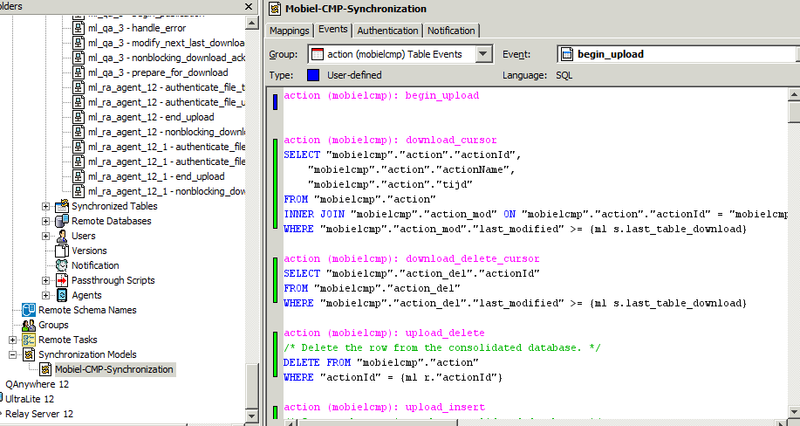 It could be that the handle_UploadData being defined as SQL causes ML server to issue the begin_upload error, somehow. I doubt we test this case of bad input. UPDATE ml_database SET sync_key = ? WHERE rid = ? I have removed it. No still doesn't work, still getting that error. Could you check if there are more events defined than desired? - AFAIK, you can query the tables ml_script, ml_connection_script and ml_table_script to list all defined scripts. That row should have been removed when you ran ml_add_connection_script with null for the script body, as Volker suggested. Perhaps the change wasn't committed? I suppose this mean it was successfully removed? Or should it say X rows affected...? Everything is the same. I mean the sql queries results are the same just like before..
Then try running it again and then run COMMIT. It may be that Interactive SQL is not set to autocommit, or only commits when you close the connection. You'll also need to restart the MobiLink server, unless you started it with -zf. Found out that I earlier accidentally selected the "begin_upload" event in the events dropdownmenu in Sybase Central > Synchronization Model. As you can see, it is marked as blue which means user-defined. How can I possibly delete this begin_upload event, as I don't need this one and I think it is the cause of the begin_upload error!